Researchers at Purdue University in Indiana believe the material, which is based on a perovskite mineral, may help in early diagnosis of neurological diseases such as Parkinson’s, and could even unlock science-fiction concepts like downloading the contents of the brain. These are still a long way off, but the team, led by Shriram Ramanathan, believes that it represents an important step towards this goal. Ramanathan’s laboratory is trying to create materials that mimic how the brain works. The major difficulty with this is that the materials we use for “thinking” machines are semiconductors, which work through conduction of electrons, whereas the brain uses currents of ions. To bridge the gap between the two modes of conduction, the researchers are investigating quantum materials, whose electrical behaviour cannot be explained by classical physics. In a paper in Nature Communications, the team explains how they have engineered a perovskite nickelate material to interact with living brain matter. Perovskites will be more familiar to Engineer readers as materials with potential for low-cost photovoltaic cells in solar panels, but in this case the electronic properties of the transition metal nickel allow charges from the ions in the brain matter to transfer into the perovskite. In their paper, the team shows that the quantum material can receive hydrogen from a slice of brain from an animal model. The source of the hydrogen is the enzyme-catalysed oxidation of chemicals in the brain; notably glucose, which is crucial to energy transfer, and dopamine, the neurotransmitter most associated with the part of the brain that controls movement and which is strongly associated with Parkinson’s disease. Dopamine levels are always low, and even lower in Parkinson’s patients. Detecting and quantifying these low levels of dopamine is one of the sources of difficulty in diagnosing Parkinson’s early enough for pharmaceutical treatment to be effective. The key to the quantum material’s effectiveness appears to be that it has a very strong affinity for hydrogen and can extract it from living brain matter without any applied energy source. 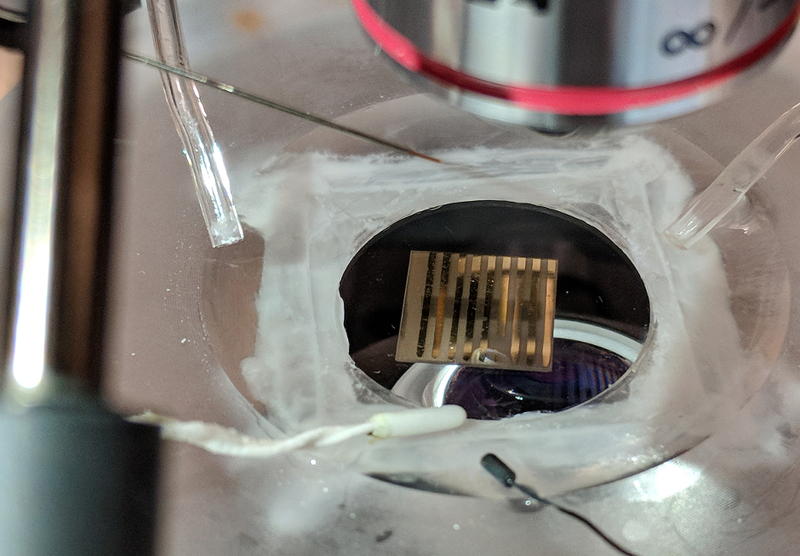 “This quantum material is about nine times more sensitive to dopamine than methods that we use currently in animal models,” said Alexander Chubykin, an assistant professor of biological sciences in the Purdue Institute for Integrative Neuroscience. “The fact that we didn’t provide power to the material for it to take in hydrogen means that it could bring very low-power electronics with high sensitivity,” Ramanathan added. Currently, communication between the quantum material and brain matter is only one way. The team is now working on enabling the perovskite to “talk back” to brain tissue.